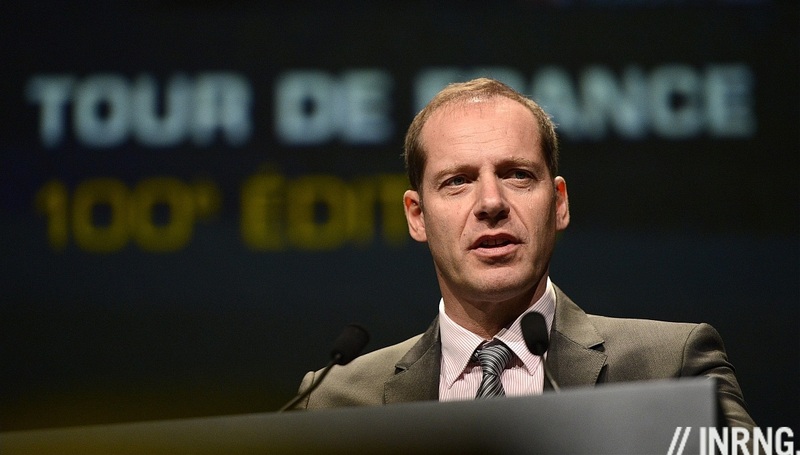 When Christian Prudhomme presented the 2013 Tour de France he started by singing the praise of the Mouvement Pour un Cyclisme Crédible (MPCC), a group of teams who have signed up to an ethical charter. It does sound good only nobody knows much about it. The same goes for other groups in the sport. Did you know there is a union that works for pro cyclists? And that the main pro teams are represented by a group called the AIGCP? Each of these three organisations represents something important in the sport but at the same time they’re discreet to the point of being invisible. Coureurs Professionnels Associés or Associated Pro Riders is the name of the riders union. It’s a formal thing headed by ex-pro, helicopter pilot and budding politician Gianni Bugno. The first union was started in 1898. Various organisations have come and gone, often being run on national lines so they never represented the pro peloton at the highest level. A riders’ strike in 1978 Tour de France galvanised the disparate unions to join together and form AICPRO but this faded. Come 1999 and many riders refused doping controls in the Giro formed the CPA was formed under the chair of Francesco Moser. It wasn’t a promising start to base a union on such defensive premises but in time the CPA has helped raise rider wages and promote a standard form of rider contract across the teams. It also demands improvements in safety, secures guaranteed time off work and ensures riders get a certificate stating how many day’s racing they did each year. So rather than being inward-looking as the 1999 start suggested it’s done some good. But it’s still stealthy to the point of being near-invisible. I’ve found a website thanks to a reader and it’s got some information. I’m not in favour of megaphone diplomacy, firing off press releases can be a sign others won’t carry your message for you, that dialogue doesn’t exist. But even many riders don’t know much about the organisation and it’s rarely cited in the media. The good news here is that the new website shows it’s making a start. Hopefully you can translate the name. This one has a website at http://mpcc.unblog.fr with some information but far from ideal. I tried to open their rulebook but it didn’t work. It would be more credible with a better website. Thanks to Wikipedia we know that Ag2r-La Mondiale, Bretagne-Schuller, Cofidis, Team Europcar, FDJ-BigMat, Garmin-Sharp, Lotto-Belisol, IAM, Netapp, Saur-Sojasun and Argos-Shimano are members. I think Orica-Greenedge are joining too. I also think there are two levels of membership, full-members and observers who can join in without signing up in full. You might remember riders being rested in the summer by their team over cortisone stories, notably Europcar’s Anthony Charteau and FDJ’s Mickaël Delage. I don’t think we ever got the bottom of Charteau’s story and in fact other riders were told to rest too but this was not made public. I can report Delage was checked and found to be OK in the end. The test is whether teams here sign up to the values when they’re in trouble. In the past we the Discovery Team break an agreement amongst all pro teams (nothing to do with the MPCC) not to hire returning dopers when they hired Ivan Basso although this quickly unravelled leaving the Discovery Team’s commitment to ethics plain to see. And similarly there was a UCI rule that said a team with three positive tests in a season had to stop but when Lampre scored a triple bust nobody noticed. But the MPCC has its heart in the right place even if it’s website and communications is in the wrong place. Again hopefully no translation needed. The AICGP lobbies the UCI and others on behalf of the big teams. Its President is Jonathan Vaughters although he’s stepping down and the replacement has yet to be announced. In fact little else is known by contrast a medieval French wine society that includes Vaughters as a member has a website. It would be nice to read further details, such as who funds them and which teams are behind this grouping and above all, the past press statements. In the past several big teams have walked out on the group, it does not speak for all the teams. But there’s no website and I think I managed to get myself on the press release list after some networking but contact is rare to put it mildly. There’s no obligation for these three groups to have a website nor join in a public debate, after all these are often loose associations. There are no plush offices in Switzerland, more a file on someone’s laptop or a stack of paper in someone’s house. But it does feel like they’re missing a chance to state what they do. This doesn’t mean expensively designed-websites and fancy branding with designer logos. A few web pages would be a start. I know some in these groups want to see this happen but it’s not been a priority and sometimes those working behind the scenes to hold the group together and handling the admin are either too busy already or not of the internet generation. Some of the most important groups in the sport are working behind the scenes. Hopefully now you know a bit more. But given the public debate over the sport in recent days, the lack of communication can leave a vacuum. When a group of teams have an ethical charter this should be something to be proud of and clearly on display. Of course signing up is no guarantee, instead it’s the work involved to meet the rules that helps more than the signature. Explaining this can reassure the media, sponsors and fans alike, as well as Monsieur Prudhomme. The same is true for a union that signs deals on behalf of most of peloton yet some riders don’t know about it and its voice doesn’t get relayed in the media. Some basic communications would be good, just as riders can speak up we need to see the teams also shout about the good things they do. I like the idea of Le Mouvement Pour un Cyclisme Crédible – it sounds like a band of super hero’s and outlays some good standards, would like to see more teams listed here. I assume Sky’s absence is purely because it conflicts with there own anti-doping mission? Though I think Sky’s approach would be more beneficial if it was as per the Le Mouvement Pour un Cyclisme Crédible! i’m an admirer of Mr Vaughters, so i’m sure it’s just luck that the Garmin riders were only banned for 6 months or they’d be required to sack them. Would they get off because they didn’t fail a test (the Lance defence)? Perhaps that’s why they keep it quiet? The more we, as observers of the sport, know about these associations, the better we can understand their actions. This may not always be in the interest of the associations though. Taking your example of the membership of the AIGCP, it may be that there are only a handful of member/teams, or that the member/teams wish to remain anonymous out of fear of reprisal for positions they may take on issues. Concerning the publication of ethical charters, press releases, etc., this is a starting point, but there also needs to be transparency and accountability concerning actions of the organization. For example, the UCI publishes its Constitution, Code of Ethics, and Rules of Good Governance on its website. This is good, however when a question arises concerning contributions to the UCI made by an athlete who is under suspicion for doping, I have still yet to see a clear accounting of the UCI’s actions. So with respect to these “invisible forcesin pro cycling,” any real understanding of their actions requires that we know where the money comes from, how it is spent, and why. Rabobank exodus had to be a serious wake-up call for the riders to ban together, take control and effect genuine credibility lest these become little more than well-organized Sunday rides for the next few years. There has been a lot to digest in the last 2 weeks and it takes some time to “turn an aircraft carrier”. UCI is not doing it nor going to and the riders, teams and sponsors must/will save this sport for us, for their love of it and livelihoods from it. Most of these things seem to be knee-jerk responses to past crises or bandages to stop the bleeding after a major scandal. Lots of talk and not much action, especially when it comes to living up to the commitments they make rather loudly at the start, then quietly when it’s time to follow through. The Dutch federation action strikes me as the first (I hope anyway) of the real alarm bells going off. How many will hear them and wake up from the years of denial will decide if pro cycling can go back to being a credible sport or become little more than entertainment, as in pro wrestling. What do you think of Nicholas Roche’s comments? His father might not wish him to be so vocal. I think it’s great that we’re seeing more and more people in cycling itself being outspoken. Far too long there’s been the famous omerta, and everyone has stayed silent. The more people that speak out the better. Some of the grief that Marcel Kittel’s got recently is disgusting, only for saying – rightly – that it’s embarrassing hearing Contador, Indurain and Sanchez say Lance is still innocent. But he doesn’t care what attacks he gets, he’s said he’s sick of people not speaking out for fear of being ostracised. The very fact this can now happen can only be a good thing. Study the regulations of MPCC and the UCI Pro Tour code of conduct. The valid components need to be consolidated into the UCI rules and in some cases have WADA oversight. Otherwise it would eventually lead to duplicated efforts and a quagmire of law suits. The emphasis on corticoids is not a bad idea, but the organization makes other sweeping demands that might be impossible to implement as contemplated in their current documents. There is a lot of rot in the Pro cycling world and the whole omerta thing is total bo**ocks. The more the young guard speak out the more hope for the future. Contador, your just an embarrassment!! What exactly does the cyclists’ union advocate? Michael Barry and others have consistently called for a safer sport as though the riders have almost no protection. And based on the description above, it seems to emphasize contracts over working conditions. In his recent NY Times piece, Barry didn’t explicitly call for a union, but he might as well have done, given the tenor of his message. Once apon a time [isn`t that how fairytales start] the olympics were an amature pursuit.USADA, it seems,has protected my governments investment in its sporting identity.The various representitives point to their local communities and attractions as they sign the checks[for USOC and USADA].But the clubs will always have a firm hand on the doorknob as investigators try to squeeze in for a look about.I think of the moment at Interbike when Armstrong waved his finger at Lemond and brushed him off regarding testing regimes.Consider he had just jetted in from NewYork where he shared the stage with Clinton and Bloomberg and the talk was of “global initiatives”.Gotta give one an inflated ego.USADA et al. are not hosting dinners at Musee D`Orsay and are likely to remain a few steps behind ,sounding pollyannaish. Viva the fourth estate and this new means of keeping a discussion ongoing. Inner Ring, thank you for being kind and keeping it real! Sticking with ya!